Style 1 Size M (Fit US size S-L): Length:36.6",Bust:46.5",Shoulder:16.5",Sleeve:23.6",Sleeve Cir:17.3",Cuff:11.0",Hem:63"
Style 1 Size L (Fit US size M-XL): Length:37.4",Bust:51.2",Shoulder:17.3",Sleeve:24",Sleeve Cir:18.1",Cuff:11.8",Hem:64.6"
Very heavyweight denim coat, good for cold day. 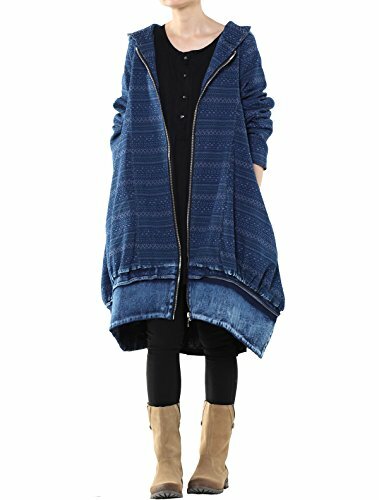 Loose style with hoodie and zipper up,easy to match sweaters,skinny jeans or leggings. Our size M can fit US size S-L, our size L can fit US size M-XL, hope you love loose fit.